Season the pork loin with salt and freshly ground black pepper. Heat 3 tablespoons of olive oil in a casserole dish. Add the pork and brown on all sides. Remove the pork and set aside. Add the remaining olive oil in the casserole dish. Add the garlic, onion and carrot and cook over a medium heat, stirring often, for 5 minutes until softened. Return the pork loin to the casserole dish. Add the peppercorns and bay leaves. Pour in enough JUST MILK to come three-quarters of the way up the pork loin. Season with salt and freshly ground pepper. 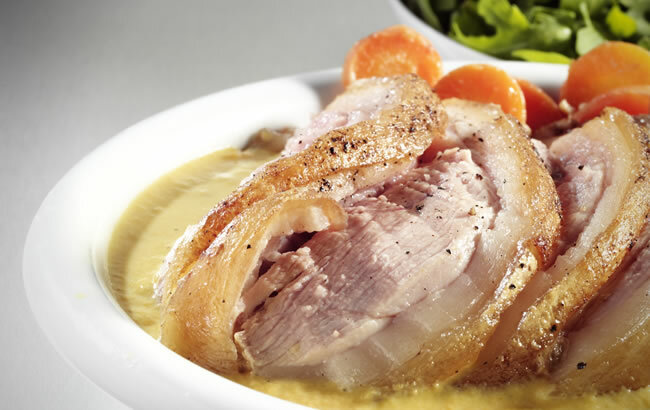 Cover the dish, and bake it for 1hour @ 190°C, turning the pork over halfway through. Once the pork is so tender that it is practically falling apart, remove it from the casserole dish and let it rest for 5 minutes, keeping warm. Meanwhile, transfer the cooking liquid and the vegetables to a blender and blend until smooth. Finely slice the pork loin and serve with the sauce made from the cooking liquid. Serve with plain rice, potatoes or green vegetables.